Tourists go to St. Thomas for its crystal clear water and idyllic beaches and resorts. But you can also learn some history in a fun way at the Pirates Treasure Museum. 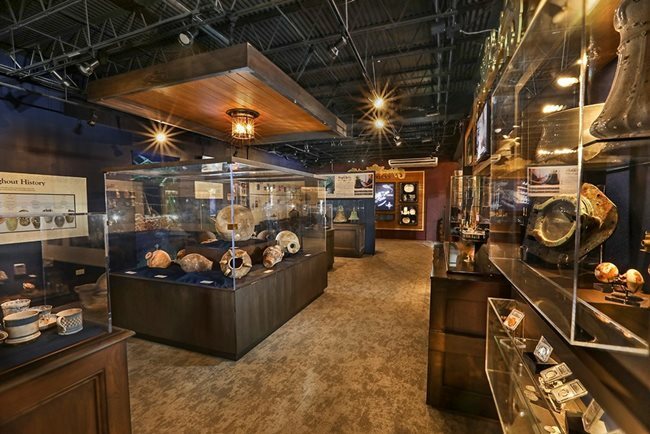 There you’ll find dozens of interactive exhibits about real pirate history, with real treasure dredged up from shipwrecks, and more. It’s centrally located in the capital city, Charlotte Amalie, near where cruise ships dock. Wonderfully, the museum is classy and informative, not crass and dumbed down for tourists. However, it’s accessible and fun, with many interactive displays: a great mix of learning and entertainment. 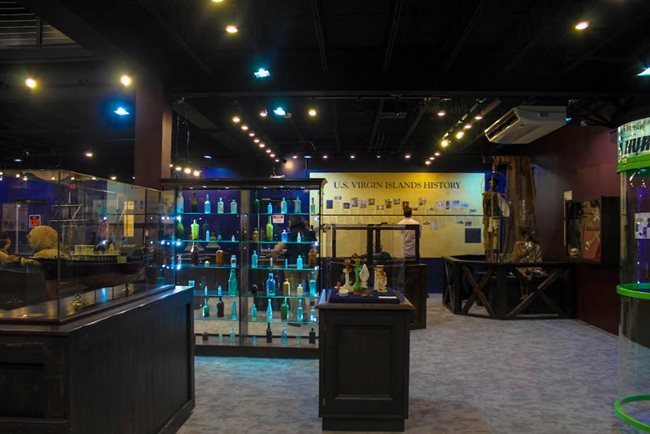 Your visit begins with a two-minute movie, and then you explore the exhibits and interactive displays. You can touch a screen of old-time bottles to get descriptions of each one. You’ll see ancient jars, the Greek amphora, and other shipping containers from history. You see real ships’ bells. They are all items taken from real shipwrecks, thanks to the owners’ background in diving and salvage machines and operations. Much of it is from a single wreck in 1865, but some of it is much older. It’s interesting to see how coral has grown around or through the shipwreck contents. You’ll see an ancient dagger and a revolver encrusted with sea stuff. But some of it has been cleaned and seems to be in perfect condition. 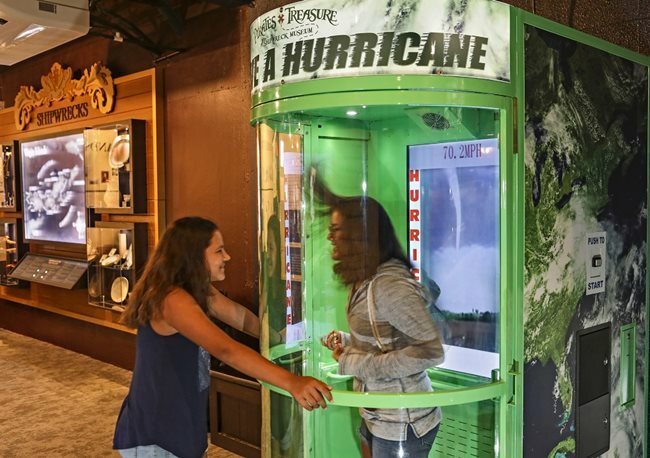 They’ve got an enclosed booth that you can step into to experience hurricane winds. And they teach about conservation, how they preserve the finds. Apparently living organisms, like bacteria, attack undersea objects, and mechanical forces like the ocean currents can rub them raw, too. We’ve been spoiled a bit by the excellent Wyhdah Museum (5 stars PLUS) in Cape Cod, Massachusetts, which came with dozens of mannequins. 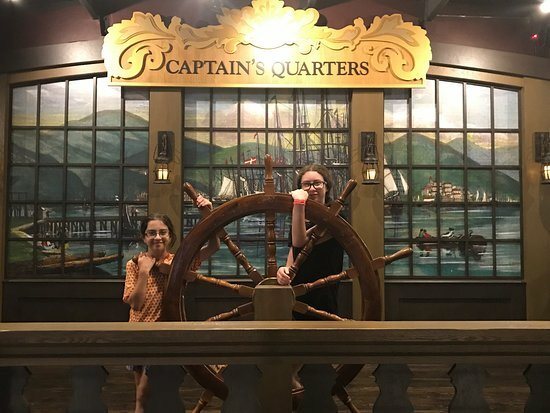 But while the Pirates Treasure Museum has only one mannequin, you can meet and take photos with a staffer dressed as the pirate Jack Sparrow, and it’s thriving with interactive exhibits. 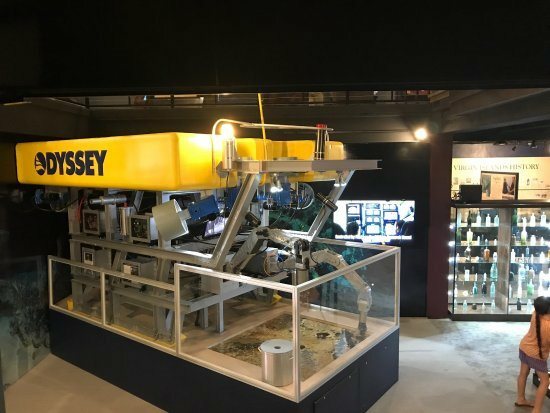 They have an Odyssey Salvage Machine whose arms you get to move and try your luck extracting pirate coins from a mockup (a dry exhibit) seabed. You can try steering a real ship’s wheel and take photos. Or put on a virtual reality headset. There’s also an interactive photo of one of their shipwrecks that you can zoom in on. There’s a replica brig, the jail on a ship. In addition, there’s plenty of outgoing staff, who approach you to answer questions, explain the exhibits, or tell you about tourism in the US Virgin Islands. Staff should wear name badges, because it wasn’t always clear who worked there and who didn’t. You’ll also find unique treats in their gift shop. In addition to the usual sell t-shirts, necklaces, and bandanas, you’ll find books, telescopes, artistic things to hang on your wall, and genuine old-timey wreckage coins and other pieces. Out front they’ve got a stockade to put your head in and take photos. 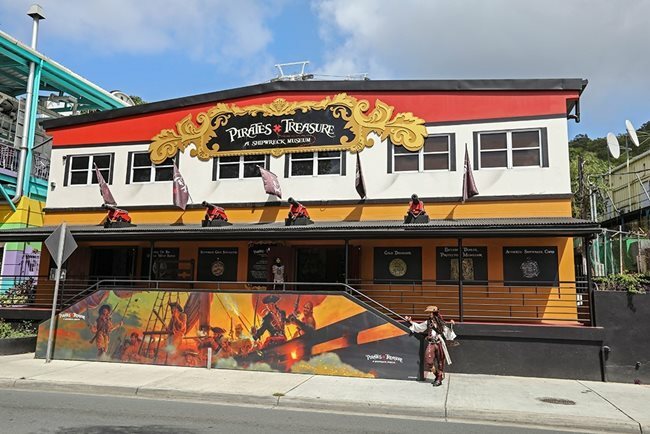 The Pirates Treasure Museum is small but the perfect combination of education and fun. Every visitor to St. Thomas who takes advantage of its beauty should pay respect to the heritage of the US Virgin Islands by visiting a slave plantation and the Pirates Treasure Museum too. 5 stars.